Background: Radial artery occlusion (RAO) is one of the few postprocedural complications of transradial approach (TRA) which may be symptomatic in some cases. The aim of this study was to investigate the safety and efficacy of enoxaparin compared with unfractionated heparin (UFH) for preventing RAO among patients who underwent elective diagnostic coronary artery angiography (CAG) via TRA. Patients and Methods: This randomized clinical trial study was conducted on patients who underwent TRA for elective diagnostic CAG. Then, the patients included were randomly divided into 2 groups. A group received 0.75 mg enoxaparin intravenously and the second group received 70–100 IU/Kg UFH single-bolus dose intravenously. During 24 h after the procedure and 3 months later, all the participants were monitored for the occurrence of RAO, access hematoma, periprocedural myocardial infarction, stroke, and death. Results: From 189 patients with mean age of 52.52 ± 6.23 years old, 95 patients received UFH (70–100 IU/kg), and the other group (n = 94) received enoxaparin after radial sheath insertion. After 24 h, decrease in radial pulse was observed in 17.6% patient (14.9% in UFH group and 20.2% in enoxaparin group) and only one patient had absent radial pulse in UFH group. There were no significant differences between UFH group compared with enoxaparin group in the reduction of the radial pulse that examined with reverse Allen test (P = 0.359). Furthermore, other complications did not differ significantly between the two groups. Conclusion: This study demonstrates that intravenous enoxaparin administration compared with intravenous UFH during diagnostic CAG via TRA is a safe and effective strategy for preventing RAO at 24 h after the procedure. Although this method is gaining more popularity in recent years, it had some complications. Radial artery occlusion (RAO) is one of the few postprocedural complications of TRA. The incidence of RAO following TRA for CAG or coronary angioplasty has been reported as between 3% and 10%.,,, A recent meta-analysis showed that incidence of RAO within 24 h was 7.7%, which decreased to 5.5% at more than 1 week follow-up. Many patients (including diabetes mellitus, female gender, and low body mass index) and procedural factors (including anticoagulation, size of sheath and catheter, and hemostasis) have been shown to influence presenting RAO. For preventing thrombosis formation in the radial artery, unfractionated heparin (UFH) has been used traditionally. The role and efficacy of other anticoagulants during TRA is unclear. Although low molecular weight heparins (LMWH) has been approved for anticoagulation during coronary interventions, there is lack of data about efficacy of LMWHs for the prevention of RAO compared with UFH during TRA. As in enoxaparin use, there is no need for checking activated clotting time, and there is less risk for heparin-induced thrombocytopenia, we decided to investigate its safety and noninferiority in these patients. Furthermore, patients who were already on enoxaparin could continue the medication without changing it to heparin before catheterization. The aim of this study was to investigate the safety and efficacy of enoxaparin compared with UFH for preventing RAO among patients who underwent elective diagnostic CAG via TRA. This randomized clinical trial study was conducted to evaluate the noninferiority of enoxaparin in compare to heparin on patients who underwent TRA for elective diagnostic CAG between March 6, 2015 and January 30, 2016 at Rajaie Cardiovascular, Medical, and Research Center, Iran University of Medical Sciences, Tehran, Iran. The procedure was done by fellowship of interventional cardiology that had done at least 400 cases of TRA coronary angiography over 6 months. Due to the pilot nature of the study, the sample size was estimated about hundred patients in each group. Patients with a palpable radial pulse and a normal Allen test were considered as appropriate for the TRA. The exclusion criteria comprised an inadequate ulnar collateral supply (assessed via the Allen test), history of allergy to the agent, and receiving thrombolytic agents during 12 h before the procedure, receiving anticoagulant agents during 6 h ago, increased risk of bleeding such as history of coagulopathy disorders, planning coronary intervention at same session, and previous treatment via the TRA. After the patients met the criteria, they were block randomized to the two groups. Local anesthesia before cannulation was effected via a subcutaneous injection of lidocaine hydrochloride 2% (10 mg) at about 1 inch above the styloid process (around the radial artery). After radial artery cannulation and introducing the guidewire, a 6 Fr hydrophilic sheath was introduced over the guidewire. Then, the patients included were randomly divided into 2 groups. A group received 0.75 mg enoxaparin intravenously and the second group received 70–100 IU/Kg UFH single-bolus dose intravenously (for reaching activated clotting time to 300–350 s). The investigators were blind to the contents of the syringe. Random block sizes were used to conceal the treatment allocation from the patients, and randomization was stratified by the clinical center. Standard catheters were used for diagnostic procedures. Radial sheath was removed in the catheterization laboratory immediately after the procedure. Puncture site was compressed with a Transradial band (TR), and the compression was relieved gradually after 1 h. TR band was removed completely 3-4 h after the procedure when the hemostasis was fully established. During 24 h after procedure and 3 months later, all the participants were monitored for the occurrence of RAO, access hematoma, periprocedural myocardial infarction, stroke, and death. The primary endpoint of this study was occurrence of RAO. Other parameters including access hematoma, periprocedural myocardial infarction, stroke, and death were considered as secondary endpoints. RAO assessment was done with palpation of the radial pulse and reverse Allen test. All the patients provided written informed consent for participation in the study, and the study protocol was approved by the Institutional Review Board and the Ethics Committee of Iran University of Medical Sciences with the IR. IUMS.FMD.REC1396.9211171025 code. The data are expressed as means ± standard deviations for the continuous and as percentages for the discrete variables. The independent samples t-test or the Mann–Whitney U-test was used to compare the continuous variables between the groups. The Pearson's Chi-square test was employed for the statistical analysis of the categorical variables, and the categorical variables were compared using the Fisher exact test, as appropriate. 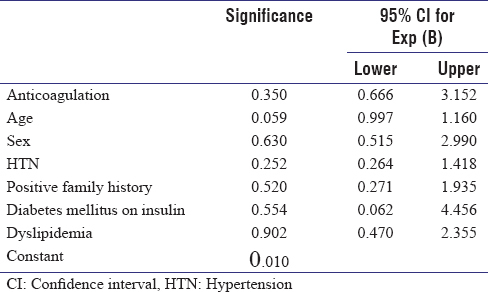 The P < 0.05 was considered statistically significant. The statistical analyses were conducted using SPSS, version 13.1 (SPSS Inc, Chicago, IL, USA). During the study period, a total of 189 patients with mean age of 52.52 ± 6.23 years old, who underwent transradial cardiac catheterization for the CAD evaluation, were enrolled into the present study. Majority of patients were male (70.4%). The patients were randomly divided into 2 groups. A group (n = 95) received UFH (70–100 IU/Kg) and other (n = 94) received enoxaparin after radial sheath insertion. The demographic characteristics of the patients, who underwent TRA, are shown in [Table 1]. The baseline characteristics had no significant differences between the 2 groups except for left main involvement. [Table 2] compares the primary and secondary endpoints of study after 24 h evaluation between the two groups. After 24 h, decrease in radial pulse was observed in 33 (17.6%) patients (14.9% in UFH group and 20.2% in enoxaparin group) and only one patient had absent radial pulse in UFH group. There were no significant differences between UFH group compared enoxaparin group in reduction of the radial pulse (P = 0.359) and also SO2 (93.64 ± 1.96 vs. 93.97 ± 1.77; P = 0.420). Furthermore, the secondary endpoints did not significantly differ between the two groups. Majority of access hematoma occurred around the puncture site (small hematoma: 12.2%), which was quickly treated by compression and suction of the hematoma and then correction of the position of TR band. In the UFH group, the lager hematoma was not observed, but in the enoxaparin group, one patient with medium and one patient with large hematoma were observed, which treated successfully by intermittent long-standing compression with cuff of blood pressure. Periprocedural myocardial infarction and death did not occur in our patient; although only one patient in enoxaparin group experienced ischemic stroke two month after the procedure which treated by conservative approach. With adjusting the different variables in the multivariate analysis which is shown in [Table 3], it was concluded that there is no significant difference between the two groups due to the type of the randomization. Anticoagulation during TRA procedures is mandatory for achieving significantly reduced the incidence of RAO. This study demonstrates that safety and efficacy intravenous enoxaparin administration during diagnostic CAG via TRA is not inferior to intravenous UFH. There was no significant difference between the two groups about RAO (based on radial pulse, reverse Allen test) and also other complications at 24 h after diagnostic CAG. In our research, we did not find any past study for comparison of LMWH with UFH for preventing RAO. Feray et al. evaluated the effectiveness of enoxaparin (60 mg through the radial sheath) for the prevention of RAO after TRA and sowed that enoxaparin is safe and effective in transradial procedures with an RAO rate of 4%. The role of other anticoagulants such as bivalirudin for the prevention of RAO following TRA procedures needs more evaluation. Plante et al. in a study comparing a single dose of 70 IU/Kg UFH during diagnostic CAG with a bivalirudin administration (bolus 0.75 mg/kg, followed by infusion at 1.75 mg/kg/h) for those undergoing coronary intervention. They found that after 30-day follow-up, the incidence of RAO in UFH group was 7%, whereas in bivalirudin group was 3.5%. Although this difference was not statistically significant (P = 0.18). Maintaining antegrade blood flow through radial artery during compression hemostasis (patent hemostasis) could be significantly reduced both early and late postprocedural RAO., Furthermore, a study showed that incidence of early and chronic RAO diminished when hemostatic compression was of shorter duration, without increase in bleeding complications. Treatment for those with RAO could be done with pharmacological and nonpharmacological methods. Bernat et al. demonstrated that a nonpharmacologic technique of 1-hour homolateral ulnar artery compression can be used for recanalization of the radial artery early after acute RAO. Furthermore, a recent meta-analysis showed that high-dose heparin during the procedure along with shorter compression duration, and patent hemostasis is associated with diminished RAO. Zankl et al. found that 10.5% of patients experience the RAO 1-day after TRA and 41.2% of them were asymptomatic. Interestedly, 4-week later, 86% of the symptomatic patients showed a partial or complete recanalization of the radial artery after treatment with LMWH. Jaradat et al. reported a case series of five patients with symptomatic RAO following TRA procedures. They used balloon angioplasty and a 90-second intrathrombus infusion of abciximab from the femoral artery approach and found that this method is a safe, effective, and durable technique for reestablishing the patency of an occluded radial artery. Furthermore, all patients were free of symptoms at follow-up. This study demonstrates that intravenous enoxaparin administration compared with intravenous UFH during diagnostic CAG via TRA is a safe and effective strategy for preventing RAO at 24 h after the procedure. Although more studies with larger samples and also more diagnostic methods such as Doppler sonography is needed. The authors certify that they have obtained all appropriate patient consent forms. In the form, the patient has given their consent for their images and other clinical information to be reported in the journal. The patients understand that their names and initials will not be published and due efforts will be made to conceal their identity, but anonymity cannot be guaranteed. Archbold RA, Robinson NM, Schilling RJ. Radial artery access for coronary angiography and percutaneous coronary intervention. BMJ 2004;329:443-6. Bertrand OF, Bélisle P, Joyal D, Costerousse O, Rao SV, Jolly SS, et al. Comparison of transradial and femoral approaches for percutaneous coronary interventions: A systematic review and hierarchical bayesian meta-analysis. Am Heart J 2012;163:632-48. Louvard Y, Lefèvre T, Allain A, Morice M. Coronary angiography through the radial or the femoral approach: The CARAFE study. Catheter Cardiovasc Interv 2001;52:181-7. Agostoni P, Biondi-Zoccai GG, de Benedictis ML, Rigattieri S, Turri M, Anselmi M, et al. Radial versus femoral approach for percutaneous coronary diagnostic and interventional procedures; systematic overview and meta-analysis of randomized trials. J Am Coll Cardiol 2004;44:349-56. Rao SV, Ou FS, Wang TY, Roe MT, Brindis R, Rumsfeld JS, et al. Trends in the prevalence and outcomes of radial and femoral approaches to percutaneous coronary intervention: A report from the national cardiovascular data registry. JACC Cardiovasc Interv 2008;1:379-86. Rathore S, Stables RH, Pauriah M, Hakeem A, Mills JD, Palmer ND, et al. Impact of length and hydrophilic coating of the introducer sheath on radial artery spasm during transradial coronary intervention: A randomized study. JACC Cardiovasc Interv 2010;3:475-83. Bertrand O, Rao S. Best Practices for Transradial Approach. Philadelphia: Lippincott Williams & Wilkins; 2014. Rashid M, Kwok CS, Pancholy S, Chugh S, Kedev SA, Bernat I, et al. Radial artery occlusion after transradial interventions: A systematic review and meta-analysis. J Am Heart Assoc 2016;5. pii: e002686. Díez JG. Practical issues on the use of enoxaparin in elective and emergent percutaneous coronary intervention. J Invasive Cardiol 2008;20:482-9. Feray H, Izgi C, Cetiner D, Men EE, Saltan Y, Baltay A, et al. Effectiveness of enoxaparin for prevention of radial artery occlusion after transradial cardiac catheterization. J Thromb Thrombolysis 2010;29:322-5. Plante S, Cantor WJ, Goldman L, Miner S, Quesnelle A, Ganapathy A, et al. Comparison of bivalirudin versus heparin on radial artery occlusion after transradial catheterization. Catheter Cardiovasc Interv 2010;76:654-8. Pancholy S, Coppola J, Patel T, Roke-Thomas M. Prevention of radial artery occlusion-patent hemostasis evaluation trial (PROPHET study): A randomized comparison of traditional versus patency documented hemostasis after transradial catheterization. Catheter Cardiovasc Interv 2008;72:335-40. Cubero JM, Lombardo J, Pedrosa C, Diaz-Bejarano D, Sanchez B, Fernandez V, et al. Radial compression guided by mean artery pressure versus standard compression with a pneumatic device (RACOMAP). Catheter Cardiovasc Interv 2009;73:467-72. Pancholy SB, Patel TM. Effect of duration of hemostatic compression on radial artery occlusion after transradial access. Catheter Cardiovasc Interv 2012;79:78-81. Bernat I, Bertrand OF, Rokyta R, Kacer M, Pesek J, Koza J, et al. Efficacy and safety of transient ulnar artery compression to recanalize acute radial artery occlusion after transradial catheterization. Am J Cardiol 2011;107:1698-701. Zankl AR, Andrassy M, Volz C, Ivandic B, Krumsdorf U, Katus HA, et al. Radial artery thrombosis following transradial coronary angiography: Incidence and rationale for treatment of symptomatic patients with low-molecular-weight heparins. Clin Res Cardiol 2010;99:841-7. Jaradat Z, Basir B, Revtyak G. Treatment of radial artery occlusions using balloon angioplasty and localized intra-arterial abciximab. J Interv Cardiol 2014;27:217-22.